I can’t say that there is really any special place in my heart for 4th of July desserts. My family was always more about the fireworks! However, that has never stopped me from making a dessert. It is pretty typical in my family and friend circles to be the one bringing sweets anyway. I have recently been doing a lot of baking, so I was inspired to make cupcakes. This version is vegan and gluten free! These cupcakes also happen to be soy free and nut free! This is the point where many people would say, well, that probably makes them not very tasty. However, I would like to beg to differ. I have been working on recipes like this one lately, playing with the replacements to make them moist and still delicious. I wish I could insert some really great story here about my family and the 4th, but there isn’t one that sticks out in my mind. There are just fond memories of going out at night and watching my big brother light fireworks for all of the family to enjoy. Oh, and how crazy those charcoal-powder snake ones were! Not to mention, without fail, every year someone in the neighborhood would set off a stink bomb! Ugh! I will say that my daughter is actually very frightened by fireworks, so between that and the fact that I’ve been clued in to how they affect pets, I stopped doing fireworks years ago. Our holiday now consists of family time and appreciating what the 4th of July means. Without further ado, I give you…Red, White + Blue Cupcakes! Beat the butter using a hand mixer on medium-low until it is smooth. Add the powered sugar, ½ cup at a time, and the vanilla. Beat this mixture until it is sweet and it reaches a desired consistency; it should spread like a regular buttercream frosting. If the frosting seems too thick, add the flaxmilk 1 tablespoon at a time until it thins to the correct consistency. Preheat oven to 375°F and line a muffin tin with paper liners. Measure the flax milk and add the vinegar to it, then stir and allow the mixture to rest for 5 minutes. Meanwhile, in a large mixing bowl, make the “eggs” as directed on the package, then allow them to rest and thicken (Alternately, you can make two flax “eggs” using 2 tablespoons of ground flax and 5 tablespoons of warm water, stirring the mixture and allowing it to sit to thicken.). Add the baking soda to the flax milk mixture and stir; it should fizz a little. Next, add the milk mixture, sugar, maple syrup (or honey), and vanilla to the bowl with the eggs and stir until blended. Add the applesauce, oil, and salt and stir until the ingredients are incorporated. To the liquid ingredients, add the gluten-free flour and cocoa powder, then stir to combine. Your batter should be slightly thin and pourable. Divide the batter evenly among the muffin tin liners, filling each about ¾ of the way full. Bake until a toothpick inserted in the center of one of the cupcakes comes out clean—20 to 25 minutes. 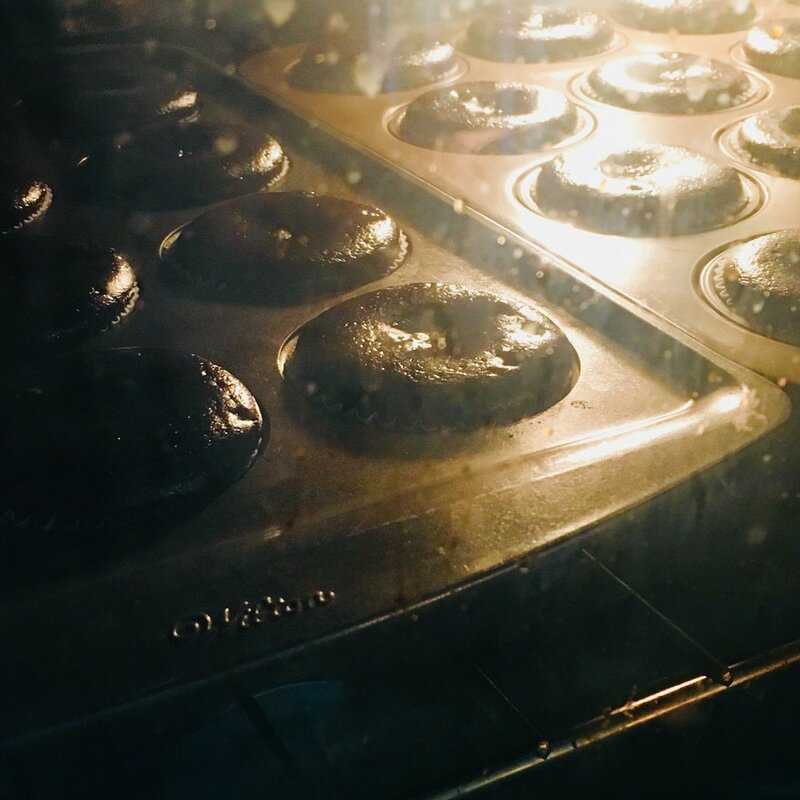 Allow the muffins to rest in the tin for 5 to 10 minutes, then remove them and place them on a cooling rack to cool completely. Frost the cupcakes, leaving a little indentation in the top middle to place fruit (see pictures). Enjoy! These cupcakes will add flare of their own to your holiday! Happy 4th of July! This recipe is adapted from Minimalist Baker’s Best Vegan Gluten-Free Chocolate Cupcakes. If the batter is too thick, add just slightly more flax milk; if it is too thin, add gluten-free flour and cocoa powder blend.